The DS has a powerful tiling engine. It can do more then just display the tiles – Each tile can be flipped on both horizontal and vertical axises and use a different palette set. In this lesson, we will go deeper and focus on the map’s format, as well as the different palette sets formats. The palette is a collection of 256 colors made up from 16 palettes of 16 colors (16×16). On 16col mode, the palette is made up from 16 palettes of 16 colors. On 16col mode, each tile can use a different set of 16col palette. This way we can manipulate the same tile using different color schemes. Tile flipping is one of the strongest features to manipulate tile’s look. It enables the tile to be flipped both horizontally and vertically, giving the tile a whole new look. Tile flipping can be used to save VRAM usage to leave more space for other tiles, or to avoid having duplicated tiles. Using both Tile flipping and tile palettes is possible – and even recommended to get best size optimized results. 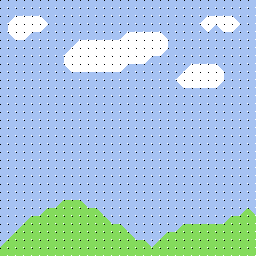 A tiled scene made using only 2 palettes and 2 tiles. To use those features, we will have to change the tile attributes in the map. To do so, we need to look deeper into the map format. A single tile in a map. Tile Index – The number of the tile to use from the tile set. Palette – Number of the palette to use from the 16 available palettes. To demonstrate tile flipping and palette selecting, we will use only one tile, that will very easy to notice when flipped. For this cause, I made this image. Since only 16col tiles can use 16×16 color mode, we will have to convert the image in 16col mode this time. The -D option will not save map data (Since we are making our own), and -P will not save Palette data (same as map). Please note that this time i have used -c16 instead of -c256. This tells gfx2gba to convert the image to 16col format. After converting, we can include the data in our project. To show the usage of tile flipping and palettes, we will use one tile shaped as an arrow and flip it 3 times using 4 different colors from different palettes. Download complete project files HERE.